Merriam turkeys are very plentiful in our area. Wild turkeys are everywhere in the Northwest mountains this time of year. 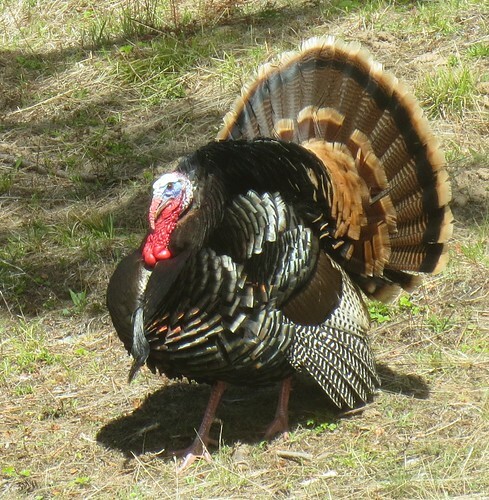 While I have seen many tom turkeys all puffed up, I had never seen one so close as this guy who was just outside my window. I was able to snap a few pictures of this very handsome tom showing off to the nearby hens. Here are a few of the hens that the big tom is trying to court. 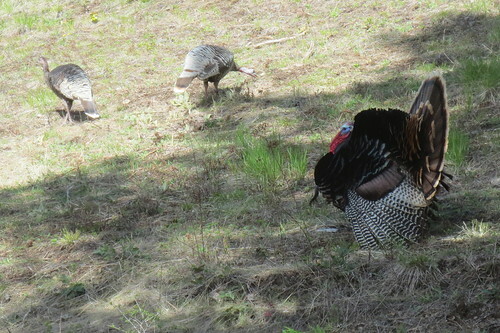 People hunt and eat these turkeys and I am told they are mainly dark meat. I personally haven’t eaten meat from a Merriam turkey but I understand they are good tasting if you season them well with herbs. I also have heard they are good if you deep-fry them in an oil cooker.